The final age group is for pre-school children aged from three to five. It is set out similarly to the toddler room but has a little more challenge for children of this age to explore and investigate. 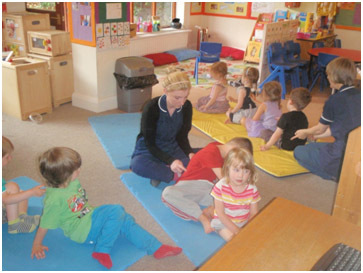 Staff in this room ensure that children are prepared for the transition to “Big School” . Through a balance of self-initiated choices and positive adult interaction we will encourage the children to become independent, happy and confident enough to go on and explore what life has to offer. 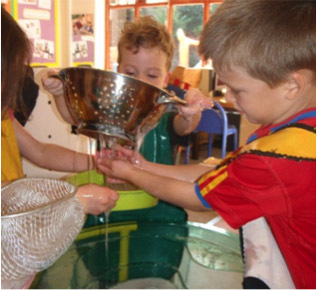 Through continuous observation we are able to discover every child’s interests and abilities which enable us to create a rich and stimulating environment both inside and outside. 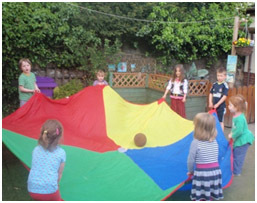 Both the pre-school group and the toddler room have the opportunity to access our extensive outdoor play area and gardens as often as they wish. The children learn to nurture fruit and vegetable plants as well as herbs in our growing border area. Physical development is encouraged through a variety of climbing and balancing opportunities, bikes to ride, dens to create and many other resources to experiment with. 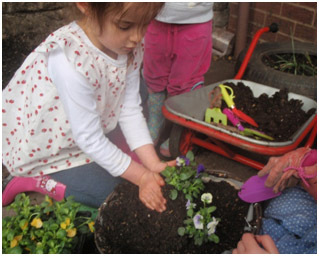 The natural environment encourages the children to make lots of discoveries and they enjoy feeding the birds and squirrels that visit our garden.